Last month, Beijing's Wang Jiahui, a software engineer, had what she described as "the most unforgettable accommodation experience", courtesy Airbnb, a key player in China's home-sharing market. More than 100 million memorable experience-craving tourists such as Wang will share 6 million-plus homes across China by 2020, spawning a market whose annual revenues are expected to reach 50 billion yuan ($7.2 billion), according to a report from the State Information Center in Beijing. Using the US-based online short-term home rental platform, Wang booked a one-week vacation at a cottage with a courtyard in Tonglu county, East China's Zhejiang province. "There were lovely bamboo trees all around amid old intertwining vines in a serene environment. The courtyard is close to the Tonglu Daqi Mountain national forest park, a 10-minute drive from the county center," said Wang, recalling how greatly her husband and son appreciated the quality time they all spent together. The host-served two-bed house, she said, is complete with smart devices and intelligent systems－laser projector, air purifier, water purifier, high-end stove, tableware, refrigerator, steam oven, what have you. "The host also prepared beverages and instant noodles for us. I was thrilled by my decision to try out the home-share concept and felt very comfortable staying there. I'll recommend homestay holidays to my friends now." In all, the week-long holiday cost Wang's family only 533 yuan. In Wang's view, that's a small price to pay, considering that Tonglu offers an irresistible mix of natural scenery and historic sites, which explains why more and more tourists have been visiting it in recent years. Karst caves, mineral springs, waterfalls, rivers, lakes, mountains and rocks－they are all here. In Tonglu, the concept of sharing economy finds expression mostly in home-share arrangements. Homeowners here offer spare rooms to tourists through online platforms such as Airbnb, Xiaozhu and Tujia. Hospitality industry experts said home-sharing services are now penetrating third-and fourth-tier cities, and rural areas, such as Tonglu across China. That marks glad tidings for the development of rural tourism, which is now seen as the key to rural economic growth and poverty alleviation. Xiaozhu data showed homestay bookings related to third-and fourth-tier cities and rural areas increased the most in the first half of this year. Home-sharing in rural areas has huge growth potential as more and more Chinese tourists are traveling to villages for unique rural experiences, said Zhang Xinhong, director of the Sharing Economy Research Center, which is part of the SIC. Major home-sharing service providers are ramping up efforts to develop rural tourism and empower locals to pursue new economic opportunities presented by home-sharing. In February, Airbnb announced a partnership with the Yanqing Tourism Committee in Beijing, as part of its efforts to promote home-sharing services and boost tourism in Yanqing. Airbnb will leverage its rich experience and extensive resources to help Yanqing transform its tourism industry, and introduce the place to international travelers. Last year, the company launched the Guilin Rural Community Tourism Program. Through the partnership with the Guilin Tourism Development Committee, Airbnb will train local families in Jinjiang village on home-sharing, hospitality standards and digital literacy. Nathan Blecharczyk, chairman of Airbnb China, said China has been Airbnb's fastest-growing market, and the country is also Airbnb's second fastest-growing outbound tourism market. The company will expand its operations to several key cities and regions before this year-end as China is projected to emerge as the largest source of tourists for Airbnb by 2020. According to Airbnb, there have been over 10 million Chinese traveler arrivals on Airbnb listings around the world since Airbnb was founded in 2008, with over half of those occurring just in the past year. The number of Chinese travelers on Airbnb grew by 100 percent year-on-year in 2017, and the number of Airbnb listings in China has grown more than 125 percent in the past year. Other home-sharing service firms are also doing well. In July, Xiaozhu teamed up with Hainan Provincial Tourism Development Commission to promote shared accommodation in villages so as to boost rural tourism. The two parties will promote the island's beautiful villages and build demonstration villages using bed-and-breakfast, or B&B, accommodation for poverty alleviation. Xiaozhu will also offer home-sharing business courses to help train local residents. The company rolled out a branded village home-sharing service in 2016. Up to July 2018, it attracted over 30,000 listings in rural areas. Lijiang in Southwest China's Yunnan province and Tonglu county in Zhejiang province are most favored by young tourists. Each B&B room can create six local jobs, said Wang Liantao, Xiaozhu's COO and co-founder. Founded in 2012, Xiaozhu now has more than 420,000 listings in over 650 cities across the globe, with over 35 million active users. The startup secured $120 million in funding last November and signed strategic partnerships with Alibaba Group Holding Ltd's travel branch Fliggy and Booking's online reservation platform Agoda in the first half of this year. As of July, the average age of the tenants was 28. And 40 percent of the guests were born after 1995, and the average age of the landlords was 36, according to Xiaozhu. According to an SIC report, the market for home-sharing services is expanding rapidly in the country. In 2017, the country's home-sharing market earned 14.5 billion yuan in revenues, up 70.6 percent year-on-year. 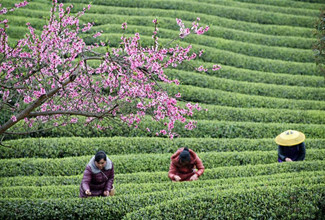 "Rural tourism has always been encouraged in China. Demand for short-term leisure tourism is on the rise as more and more people prefer to get close to nature and stay away from the hustle and bustle of cities," said Lai Zhen, an analyst at market research firm iResearch. Lai said short-term home rentals and homestay services are wide-ranging now to satisfy the needs of various kinds of tourists. Typically, customers hire such services for get-togethers, reunions, team-building activities and to improve parent-child bonding and communication. The cooperation between the government and enterprises to build tourism projects in rural areas will create more job opportunities for villagers. At the same time, the projects will alleviate poverty to some extent, Lai said. Although tourism still remains the most important reason why people chose short-term home rentals on online platforms, "holding parties" is fast emerging as a key factor too, according to a report from Xiaozhu. "We found that the proportion of bookings for holding parties, playing board games and watching movies is on the rise. We'll satisfy consumers' demand by providing bookings for a wide range of homestay services," said Yang Changle, COO of Tujia. Tujia data showed party bookings for homes with four to five bedrooms increased over 60 percent year-on-year between July 2017 and June this year, with big demand coming from Beijing, Shanghai, Guangzhou, Hangzhou and Chengdu. "The authorities concerned should step up efforts to formulate standards for the emerging market and implement detailed safety rules, in cooperation with sharing accommodation providers. That kind of approach will help the healthy and orderly development of online short-term rental services," Lai said. Liu Junhai, a business law professor with the Renmin University of China, said short-term rental websites can help promote optimal utilization of existing resources like rental housing. "The market is not mature yet. The quality of management should be improved. Online platforms need to strengthen self-discipline," said Liu.